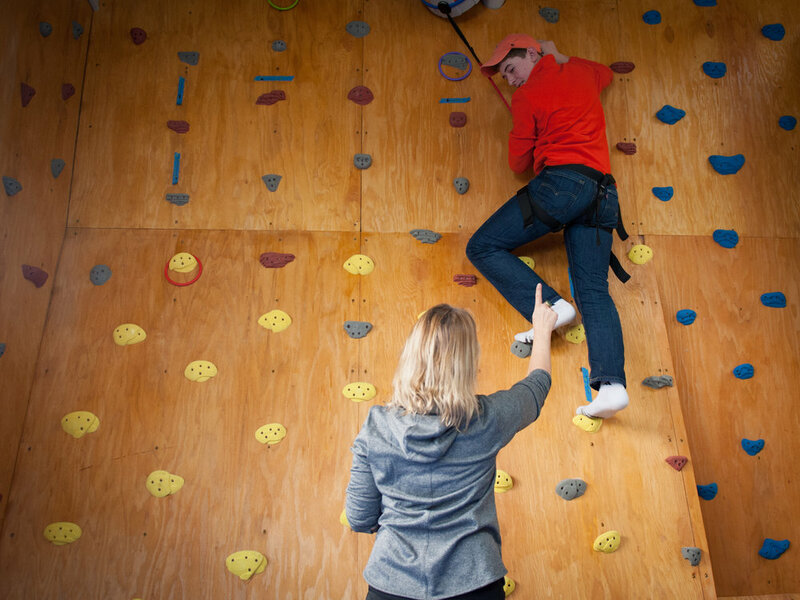 What is different with The Helix School Occupational Therapy program? The OT program at THS is developed to build a strong foundation from which our students can grow physically, emotionally, socially and academically. Our program differs from the traditional school OT model that teaches functional skills such as handwriting, pencil grasp and providing fidgets to pay attention. At THS, we developed a unique school program that follows the school’s model to work from the roots upward, and is in line with our belief that function must start from a strong neurosensory foundation. This foundation harnesses emotional regulation and gets our brains awake and ready to learn. Rhythmic activities are overlaid for their impact on respiration, heart beat, and the cadences of moving, walking and speech. Each component is vital to reduce anxiety and feel safe, improving our students ability to engage socially, playfully and academically. This exciting model allows us to draw upon groundbreaking work from of some of the leading minds of neurosensory development. 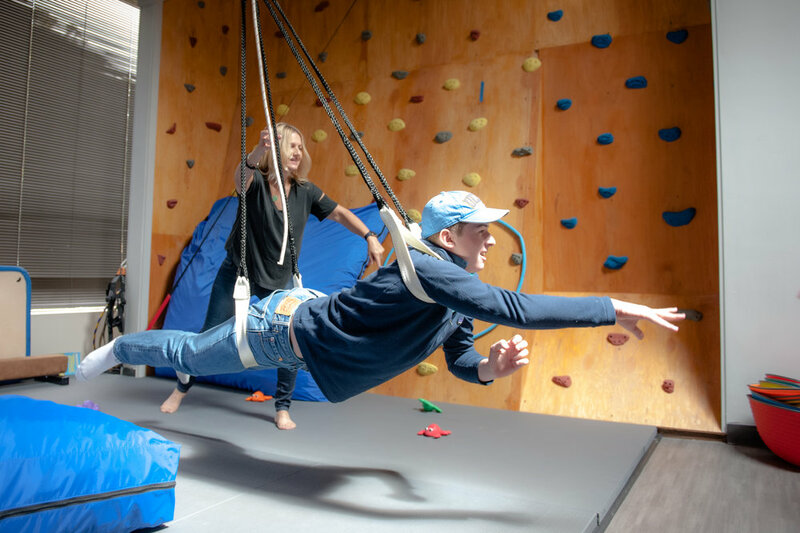 Direct (1:1) therapy sessions improve neurosensory development and teach functional skills for our students to take on the social, academic and motor demands of their day. Classrooms push-in enables on the spot suggestions based on what is unfolding for each individual student. We hold a strong belief in the education process and maintain ongoing continuing education that is up to date in the field of neurosensory development to fuse this information into our treatments and bring it back to our team with teacher and staff in-services and parent education. The Speech and Language Program is an integral part of the program. 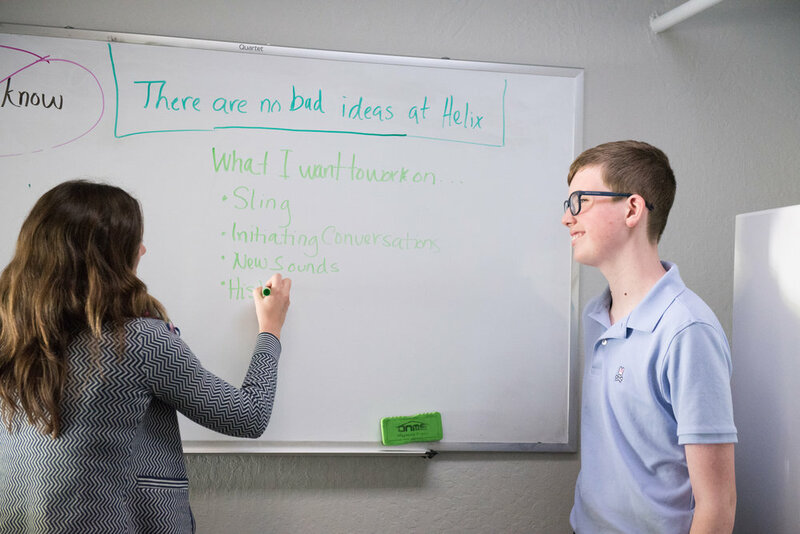 We use effective strategies to serve the needs of the students at Helix. The Speech Language Pathologists are responsible for evaluation, direct treatment, teacher and parent training as it pertains to communication, and social skills development. that emotional regulation and social communication should be worked on in tandem when supporting children with ASD. Language, social communication, and emotional regulation goals are developed based on the SAP. Goals targeted may include initiation, reciprocity, understanding and expressing emotions and arousal, reading nonverbal social cues, conversation skills, improving articulation, sentence expansion, use of a variety of grammatical markers and descriptive words, etc. Speech and Language teaching strategies and approaches are infused throughout everything that the kids do across each school day.